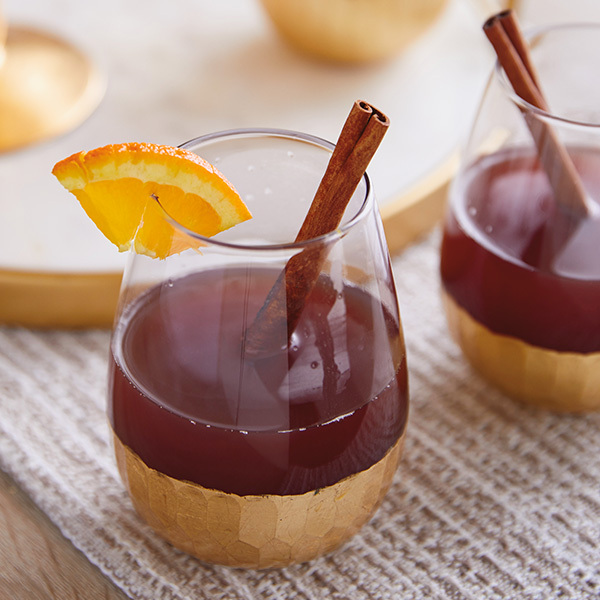 Nothing sets a warm holiday mood like wassail, a fancy mulled cider. Use your slow cooker for this one—the four-hour simmer time lets all the flavors blend together. Poke whole cloves into the orange—you can make a pattern, or put them in at random. If the stems break as you’re poking them in, try making a whole with a toothpick first. Core the apple and cut it into thin slices. Add all other ingredients to a slow cooker or large pot and stir to mix. Add clove-studded orange and apple slices. Heat to a boil, then immediately lower to a simmer. Let punch simmer for about 4 hours. Strain out cinnamon sticks and any clove debris before serving. Ladle into heat-resistant cups or mugs. Add whiskey, bourbon, or rum, if desired. Garnish with cinnamon sticks and apple slices, if desired.